This event is past, but we have a video recording of the Music and Meditation event. On Saturday, April 28 we will have a special interfaith gathering of Music and Meditation. We will be featuring a live performance by the Australian Concert Violinist, Marlene Crone. Marlene Crone started learning violin at the age of seven. She was recipient of the Ohman Music Scholarship at Methodist Ladies College from 2005-2009. 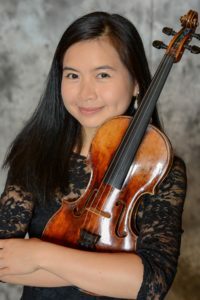 In 2014 she was awarded her Bachelor of Music in Violin performance from the Johannes-Gutenberg-University in Mainz, Germany under the tutelage of Prof. Ervis Gega. She then successfully completed her Master of Music in 2017 studying with Prof. Benjamin Bergmann in Mainz. Currently she plays in the Hessen State Orchestra Wiesbaden and will commence in October 2018 at the Frankfurt University of the Arts, her second Master studies specializing in Baroque Violin. Her career dream is to win a permanent position in a professional German orchestra and freelance as a baroque violinist at the same time. Meditation and music go hand-in-hand so that she has been joining online meditation groups whenever she can after being introduced to it through her parents. She is certain sharing God’s love through music is her calling. This gathering will be one hour and 15 minutes and will feature four segments of a five minute performance by Marlene Crone followed by a 10 minute silent meditation. At the end of the four segments, we will have 15 minutes for open sharing. The music will be in place of readings. If you haven’t already done so, read the site rules and be sure you agree with them. If you haven’t already done so, Register as a chapel user. This allows us to contact you with important news about the site including this event. We never rent our or share your email and you can remove yourself from the list at any time. Note: If you are just attending a single event, registration is not necessary, but it will allow us to let you know of future events. If you haven’t already done so, and if you are using a smart phone or tablet, you need to install Zoom. You will be able to find Zoom on your app store. If you are using a PC, Zoom will be installed into your browser the first time you enter any chapel. Zoom is the video conferencing system we use for our chapels. On Saturday, April 28, when it is time for the event to begin, go to The Peace Chapel. Click on the link to “Enter the Chapel.” That will start up a zoom session. Your microphone should be muted for the first hour, and then unmuted when you are ready to share for the last 15 minutes.